There is no getting away from the fact that social media takes up a lot of time. Finding content, scheduling, responding to the comments and generally being social can’t be done in just 10 mins a day. The more platforms you use, the more time it’s going to take you. I’d go with Phil Pallen’s, a smart and sassy brand and social media guy, advice on this, stick to a maximum of 3 platforms. I don’t know of anyone who doesn’t want to save time on their social activities. The good news is there are a shed load of tools designed to make you super efficient. I often get asked which tool I would recommend and the simple answer is there is no one tool out there that will do everything you need it to I use a combination of these four tools to manage my social media efforts. This is my new favourite tool, you add content to a queue and Edgar will deliver it according to a schedule you set up. 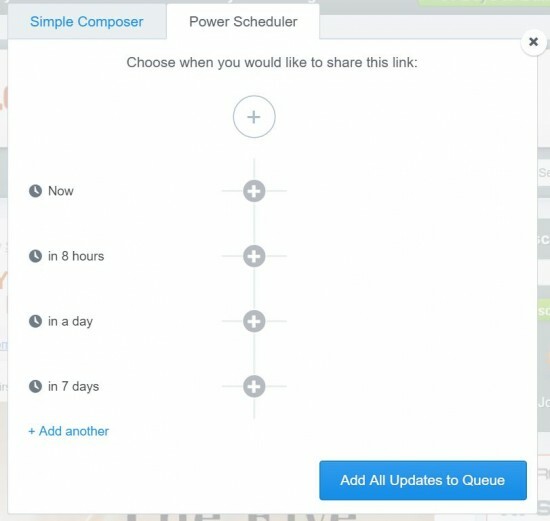 Unlike other schedulers once the content has been shared it is added back into the queue to be shared again. It’s great for Twitter! Meet Edgar integrates with Facebook Pages, Groups & Profile and LinkedIn Company Pages and Profiles. The recurring feature has less value when using LinkedIn and Facebook but there is the option to only post certain content once. The ability to categorise your content means you have control over what get shared and on what platform. Meet Edgar is time consuming to set up, you need a decent amount of content added to your library so it’s not repeated too quickly. Once you have you can relax knowing your Twitter feed will always be active even when you are pushed to find the time to schedule content. It’s easy to find interesting posts to share by importing RSS feeds from your favourite blogs. You can choose to automatically add them to your library or review them first. So far, so fabulous! Butthere are a few downsides, the first is the price. There is no free option and the starting price per month is $49 for which you can add 10 accounts. There is a two week trial to see if it works for you and when you sign up you will receive regular emails about how much time Meet Edgar has saved you. I have no idea how accurate this is but it makes me feel better about my monthly investment. Hootsuite has been featuring on lists such as this for years and for good reason. This tool allows you to see all your social media accounts on an easy to read dashboard. No more hopping around to keep track of real time activity. The desktop is where Hootsuite reigns but the app is pretty decent, giving you a good chunk of the same functionality as the desktop. You can schedule your content easily on the site or by using the Hootlet Chrome extension. There are options to enable autoscheduling of content suggested by Hootsuite based on designated keywords. Autoscheduling makes me uncomfortable, I know it can save a lot of time but too much automation and you might as well be a content spewing robot. Hootsuite provides a free option but if you want to have more than 3 social profiles then you will need to go for the $9.99 a month Pro subscription. Bonus features include running Facebook adverts and setting up a variety of campaigns including photo competitions, sign up pages and sweepstakes. I haven’t tried the campaigns yet but if you have I’d love to hear what you think of them. The Facebook adverts option is limited, if you are serious about making the most of Facebook ads you can’t beat doing it directly through the Facebook Ad Manager. Buffer is simple and straightforward to use. It doesn’t require much set up, add your accounts and download the Chrome extension and you are good to go. You can add content to your Buffer account and it will schedule it automatically based on engagement of previous posts and tweets. Or you can choose for tweets and posts to be sent at predetermined times which you can set for each platform. When you use the Chrome extension to Buffer a web page you have the option on the Power Scheduler to repeat the post a number of times. You can add one profiles for each social media account, if you are a small business this should be all you need. If you want to have more than one social profile then you can sign up for the Awesome plan at $10 a month. The subscription allows you to schedule 100 posts an add 15 RSS feeds. Cost – Free for the Individual plan and $10 a month for the Awesome plan. Getting useful content delivered to one place is exactly what Feedly is made for. Feedly curates content based industry and on search terms that you set up. It makes keeping up to date and sharing valuable content easy. The app has a great swipe feature which means you can quickly zip passed the suggested webpages that aren’t relevant. Tap to read anything that catches your eye and then share it. If you want to more tips and tools to help your social media sign up to the Spice Newsletter.